Wing Chun is a wonderful martial art that allows the practitioner to utilize his or her opponent's techniques and force against them. Many martial arts focus solely on expending outward force by generating energy through proper chambers, which means pulling the fist back in order to punch forward, pulling the knee in to release a strong kick, or "winding up" in some way before a strike or block. This technique proves very effective, and I respect all martial arts and their talented, dedicated practitioners. Wing Chun Kung Fu focuses so much attention on rooting oneself to the ground, and using energy projection as a means to create devastating power with little to no warning. In Wing Chun, the practitioner learns to have "sticky hands," which they use to stick with an opponent's striking weapons, and trap them. 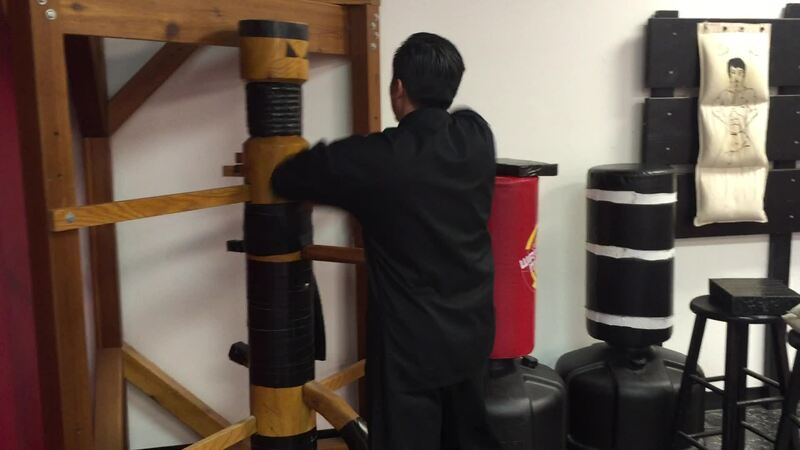 Wing Chun practitioners strive to take their opponent's center line, and drive them back with strong and rapid attacks in a range one step closer than boxing range. This range is called trapping range, and it is very hard to use your eyes in this close of proximity. Wing Chun martial artists train to rely on their other senses to know where to block and attack, so they can react faster than their eyes have time to tell them to react, and can throw faster techniques than their opponents can register. This is what makes Wing Chun such a unique and formidable art. This video shows 5th degree Taekwondo black belt and advanced Wing Chun practitioner Master Vu Tach demonstrating the deadly speed of flowing techniques of Wing Chun on a Wing Chun wooden dummy.